This is Not Your Mama's Alfredo Sauce for a reason. 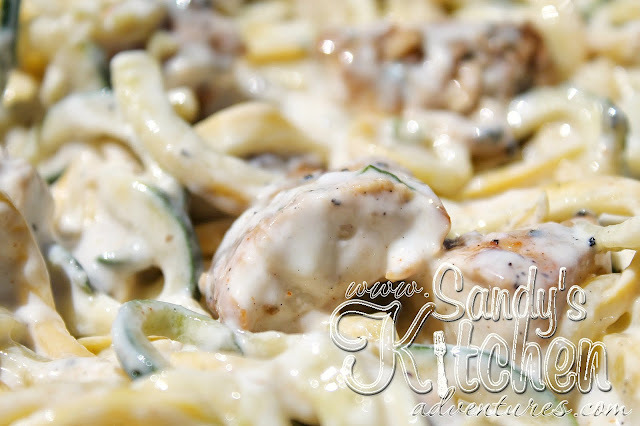 This recipe doesn't have all the cream, butter, flour and other unhealthy ingredients that traditional Alfredo recipes might have. It actually has only a few ingredients, but with those few ingredients, it packs a ton of flavor. What I like most about this sauce is that it is smooth, thick and creamy. It really sticks to the squash noodles and chicken. No watery sauce for me! 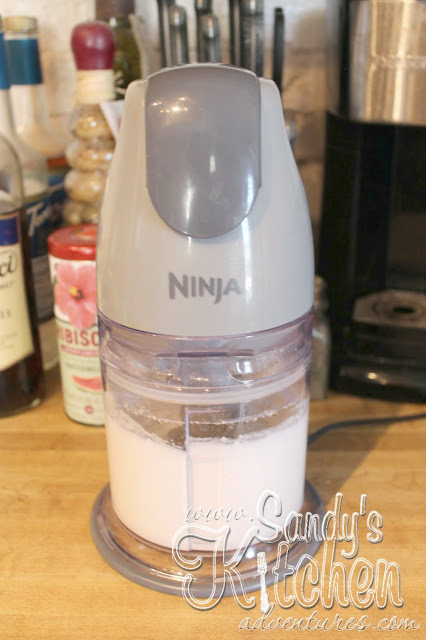 I used my Ninja to blend the ingredients together but you can use any small blender you like. 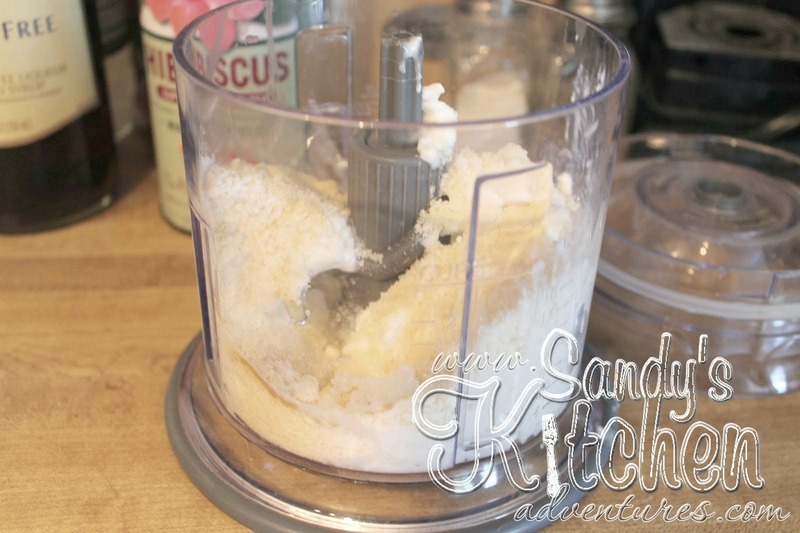 You just want to blend until all the ingredients have a smooth texture, resembling sauce. I added cottage cheese, garlic powder, Parmesan cheese, unsweetened almond milk and black pepper. That's it! You are done! Easy peasy! The sauce is actually a great source of protein because of the cottage cheese and it doesn't have a lot of fat! It is right up my alley! You can kind of see the thickness in this photo. Feel free to add a little more almond milk if you don't want the sauce as thick. 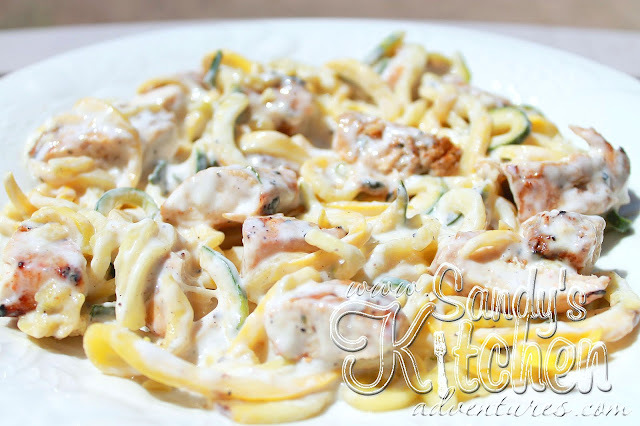 I chose to serve the sauce on spiraled yellow squash and zucchini so that it resembled pasta. My favorite spiralizer is Paderno which I got from Amazon. Right now it is running about $35 with free shipping, but the price is always changing so check it out. They are really simple to us. You just press the zucchini against the blade of the slicer and crank the handle. As you crank the handle, the spirals come out on the other side. The best part about this machine, is that you don't have to worry about your hand coming in contact with the blade while you are spiraling. Also, this machine will take out the core of the squash which has the seeds. The seeds prevent the noodles from holding together, so you want to make sure the core isn't included. Another option is the Veggetti which is also on Amazon but I think you can find it in some of the big box stores such as Target and Bed Bath and Beyond. This runs around $13. You can also use any julienne peeler you like and get great results. These are easy to find and run around $10 or less. If you use one of these peelers, you would pass the peeler down the side of the squash, lengthwise. When you approach the seeds, turn the zucchini and slice another side. Chicken Alfredo never looked so good! With added color from the squash, healthy nutrients from using veggies instead of pasta, and creamy sauce packed with protein... what more could I ask for in kick starting my weight loss? Enjoy! Prepare your squash. You can peel your squash so that it resembles pasta or leave the peel on to add more color to the dish. I like to leave it on because the peel has extra fiber that can regulate your digestive system. Cut the ends off and discard. Next decide which gadget you want to use to make your noodles. Measure out 1 1/2 cups. Add 1 tsp olive oil to a medium skillet and heat over medium-high heat. Add spiraled squash to the oil and cook until squash gets tender for about 2 minutes. Add basil and any other additional seasonings such as salt, pepper, or garlic powder if desired. Put on a plate and set aside. To make Alfredo sauce, combine cottage cheese, salt, garlic powder, Parmesan cheese, almond milk and pepper in a small blender until mixture is smooth and creamy. Pour into a microwave safe dish and heat until warm (about 45 sec to 1 min), stopping the microwave every 15 seconds to stir. 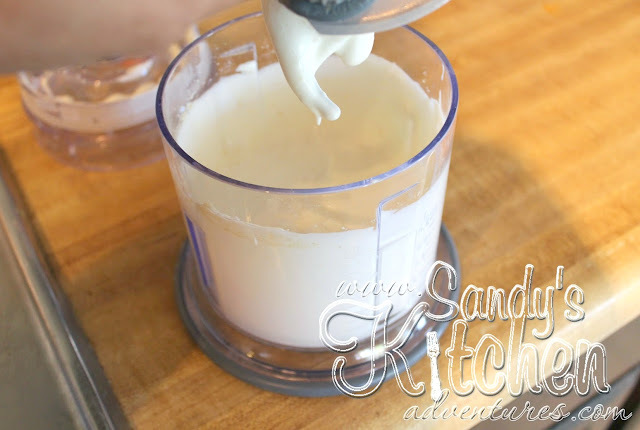 Make sure the cottage cheese doesn't get too hot because cottage cheese and heat do not mix well. It will start to separate, get stringy, and watery. Once it was mixed with the squash and chicken, I had no problems with re-heating. Place cooked diced chicken over squash noodles and then pour warm sauce on top. Enjoy!